First Blood unleashed the fury of Rambo’s rage. Now he is in prison for his one-man war against a small-town police chief. His former commanding officer, Colonel Trautman, arrives with a promise to release Rambo, with two important conditions. First, Rambo must return to the Vietnamese prison camp from which he escaped and find the missing Americans who are rumored to be prisoners there. The second condition? Don’t rescue the prisoners. Only bring back photos. Under no circumstances engage the enemy. For Rambo, the first part is difficult. But the second is impossible. ©1985 David Morrell (P)2013 Brilliance Audio, Inc.
entertaining, but not as good as first blood. Any fan of action will enjoy this book. I couldn't stop listing, you get a peak of James Cameron's version , the theatrical and an original story all in one. This novelization of the movie script is amazingly creative, for moments, and unless you don't know it, makes you feel like the movie was based on the book and no the other way around as is the reality. Great book!!! Another great performance and story! 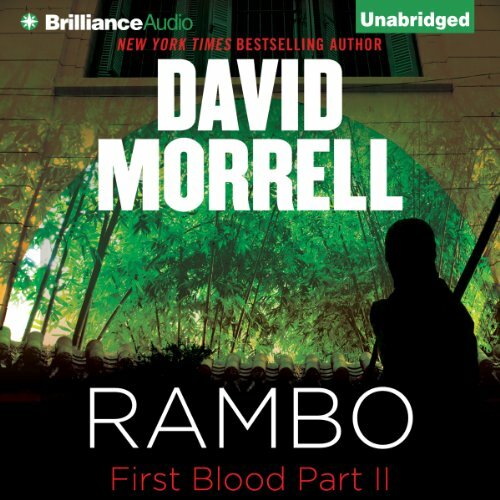 Where does Rambo rank among all the audiobooks you’ve listened to so far? Not the best by any means, but certainly enjoyable. What was one of the most memorable moments of Rambo? Which character – as performed by Eric G. Dove – was your favorite? The Rambo character for sure - Once again, Eric Dove did a great job at making Rambo sound just like Sylvester Stallone did in the movies. If you enjoyed the Rambo Film series, it's almost a certainty that you'll enjoy the book as well. This book fully explains how Rambo was able to kill hundreds of people in this story!